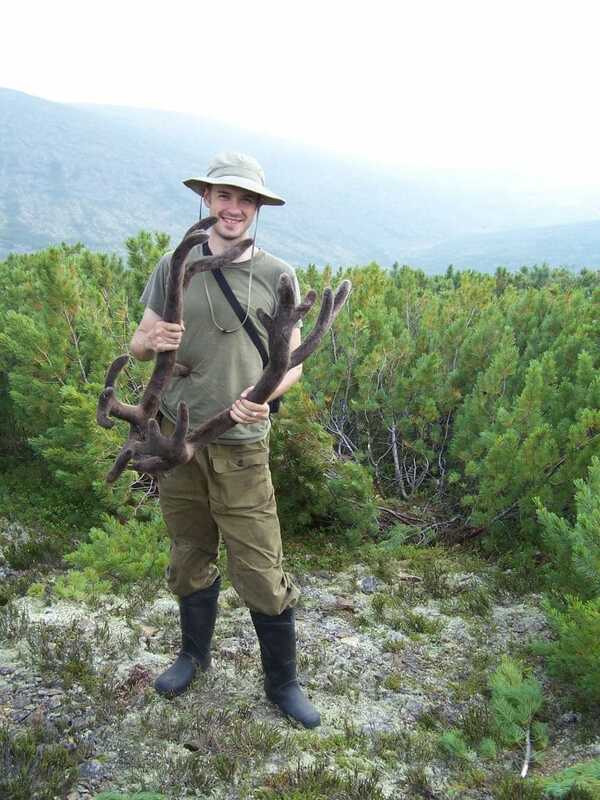 I first became aware of the Evenki reindeer-herding nomads of the Siberian Far East as an undergraduate pursuing a Bachelors of Science in Anthropology. Fascinated by the idea of an entire culture based on fur hunting and reindeer husbandry, I began to research the history of the Evenki from the prehistoric domestication of the reindeer to the collapse of the Soviet Union in 1991. As state subsidies dissolved so too did the widely mismanaged state reindeer farms. The herds were dispersed among the families of the Evenki workers who have since returned to less industrialized and more traditional forms of reindeer pastoralism and fur hunting. I began to research problems and perspectives of these family collectives in context of post-Soviet land reforms and natural resource exploitation. Fortunate enough to win the necessary grants, I began planning a year-long research trip to Russia. Organized through the School of Russian and Asian Studies, I first completed intensive Russian language training at St. Petersburg State University with a corresponding internship at the Russian Ethnographic Museum. From there I traveled across Siberia to Khabarovsk for further language training and research consultation at the Khabarovsk State Pedagogical Institute. There I was connected to the Association of Northern Minority Nationalities who referred me to their office in Tynda—the launching point for my two-month fieldwork in an Evenki reindeer collective. Joshua Blackwelder lived with a group of Evenki reindeer herders in Siberia for two and a half months, performing ethnographic research. Once in Tynda I was introduced to the heads of seven reindeer collectives, who were returning to their camps in the Taiga from an annual auction of sable furs. After toasting away two-bottles of vodka, I made my offer. I asked to accompany any one of them to their camp for a period of two and a half months. There I would help out as they saw fit while taking notes and photographs. In exchange, I offered to purchase their summer supply of food. The first five leaders rejected the proposal and the sixth accepted. The trip began the next morning involving three days of logging trains, rafts, jeeps, and finally boots and backpacks. I’m not sure if offering to donate items is common among other ethnographers or not, but it certainly made my job easier. I think that having a foreign ethnographer there for such a long time is — at least initially — a risky and uncomfortable experience. They may feel liable for the safety of a foreigner or excessively scrutinized. Many are therefore hesitant to accept. By offering the food I was able to offer them an economic incentive to compensate for the disincentives. I was careful not to offer anything that they didn’t already have in the culture — such as a GPS device, which might have changed the cultural landscape I was trying to study. The free food helped them financially, off-set any calorie loss that might have occurred from feeding me, and maintained their already existing lifestyle. As the Evenki diet is simple, I spent about $450. 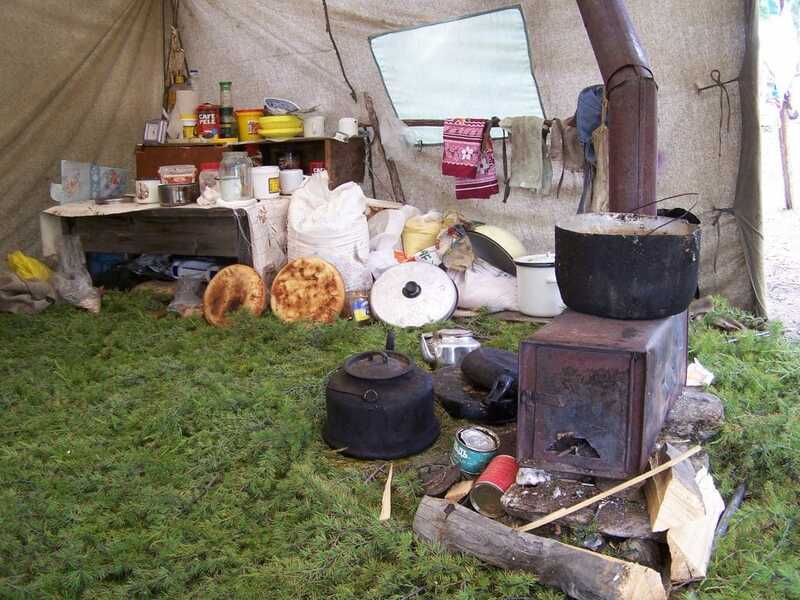 A typical campsite for the Evenki herders. Top is the canvas army tent, center shows supplies and a reindeer skin bed, while bottom shows a camp kitchen. I approached the camp for the first time after nightfall. I was greeted first by a pack of growling husky-mutts who calmed down after they recognized Slava, the camp leader. As we walked closer I began to hear deep guttural grunting from the unseen reindeer grazing in the woods around me. Slava explained that in the summer months, the reindeer would scatter through the surrounding hills and graze at night while the temperature was cool and the mosquitoes were fewer. 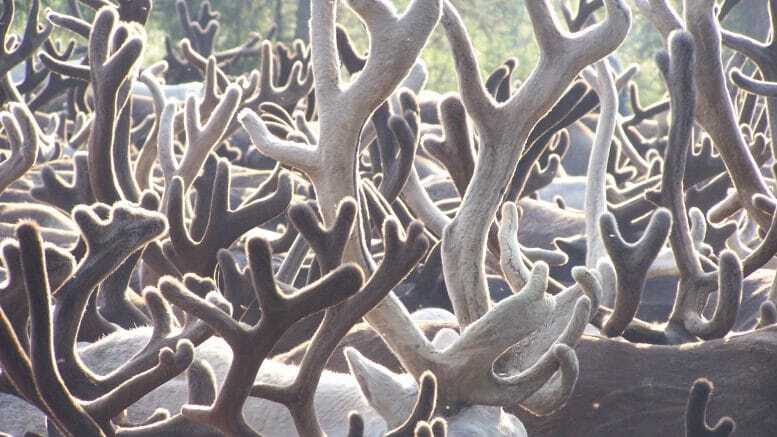 The collective kept 400 head of reindeer that are only corralled during the hours prior to a migration. During the day the reindeer return to camp to escape the heat and the clouds of blood-sucking insects. The four tents of the camp are arranged in a circle alongside a series of fire pits which are tended throughout the day. Two tents were used by herders and their family members visiting during the summer. The other two tents housed the single “ranch hands.” I was in one of these tents. The reindeer gather within the tent circle while the smoking fires drive away the swarming insects. 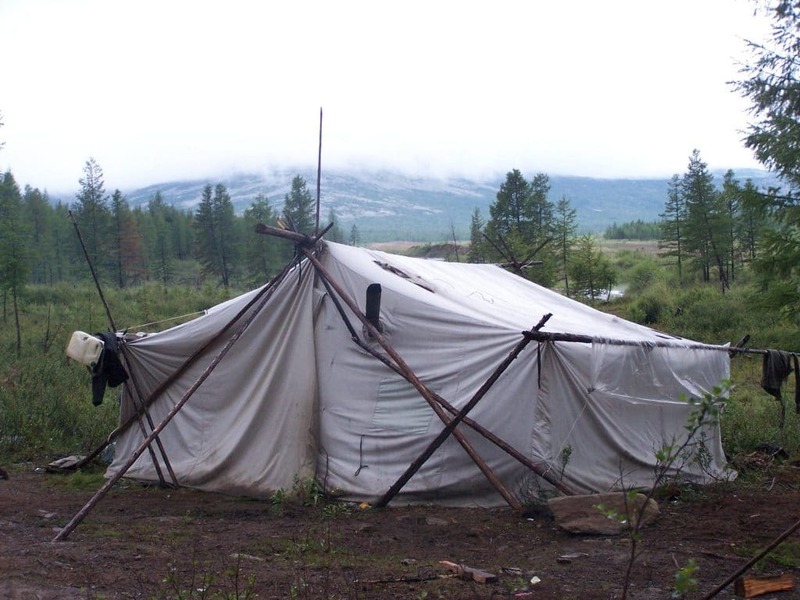 Traditionally Evenki tents were made of birch bark in the summer and reindeer fur in the winter. Since they began to be conscripted into the Soviet army however, they have adopted canvas tents similar to what the army uses. This change likely may have occurred because the portability of the light fabric was a huge benefit during migrations. They are harder to keep warm, but firewood is not in short supply in the Taiga. Inside the tents the open floor is lined with soft branches. In the center of the tent is a small wood burning stove with a tea kettle atop. Reindeer hides act as mattress pads and blankets. 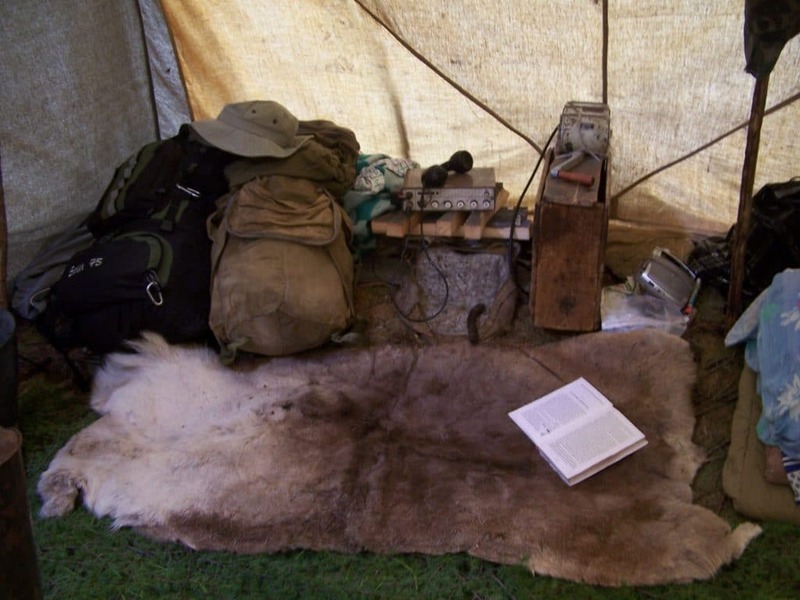 A single hand-powered radio transmitter in the corner of one tent functioned as the only form of outside communication. Calls went directly to the district dispatch. The dispatch would relay typed messages from the villagers to the distant camps and could accept incoming messages as well. Against the opposite tent pole leaned the hunting rifles—including WWII-era Mosin m/44 carbines. At night I would drink thick black tea or vodka around the stove before lying down on the fur pad to sleep and in the early mornings I would awake to the grunting and shuffling of the returning reindeer. Meat and lepushki are the core staples of the Evenki diet. Lepushki are unleavened loaves of wheat bread, broken—not sliced—and dipped in vegetable oil. They are similar to Russian lepyeski, but used no honey or sourcream in the baking process, meaning that the bread was exceptionally thick, heavy, and very dry. perishable organ meats: brains, eyes, kidneys, liver, and heart. Bones are boiled and broken and the jellied marrow eaten. Depending on the season, even the antlers can be roasted and eaten. Pits, dug into the earth and covered with sticks and rocks, functioned as makeshift refrigerators. Seven or eight times richer than goat milk, reindeer milk is thick—bordering on the texture of yogurt—and serves as the most important source of vitamins in the Evenki diet. Children too young to hunt usually spend the day milking the reindeer, or else gathering wild berries and fishing. Berries mixed with fresh reindeer milk are an especial treat. Before each meal, a small portion of the food is fed to the fire spirit who is thought to protect the camp. 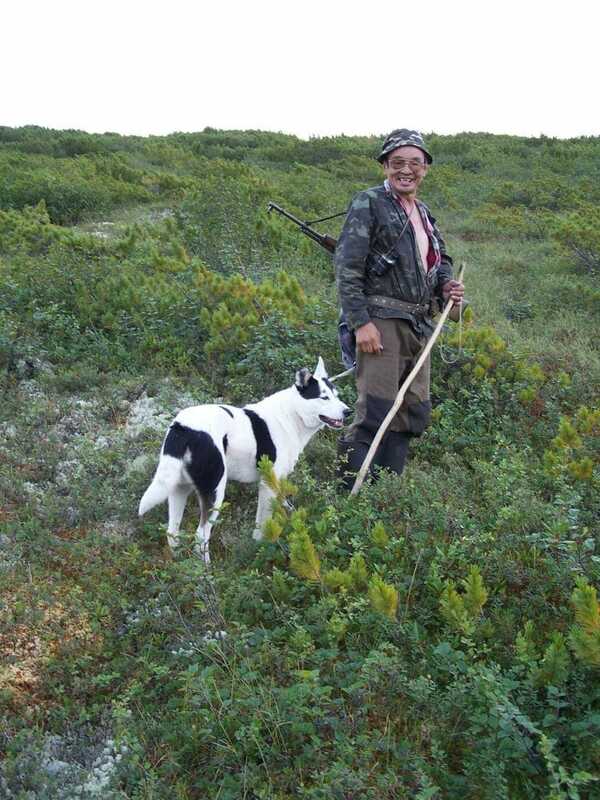 Unlike northern tundra nationalities such as the Dolgans, Koryats, and Chuckchee, the Taiga-dwelling Evenki do not raise their herds for slaughter and meat sales. Rather, their herds are raised for purposes of transportation, milk, and insurance against emergency food shortages. Their main income comes from the sale of hunted fur species such as sable and minx. The deer meat that is eaten daily comes from hunting wild reindeer in the area. Other income comes through the spouses that remain in the villages. They might sell fruits and vegetables, teach school, or work in the village shop or post office. After camp is set in a new pasture, several of the men will load up one reindeer with enough lepushki to last one day. They call the best trained tracking dog and travel higher in the mountains for the hunt. Once the food supply is gone, the hunters are dependent upon whatever they are able to gather. I recall one particularly sparse hunt in which the hunters and I traveled for two days without food—living off a couple handfuls of gathered berries and a small grouse we had managed to shoot. Although the Evenki raise reindeer herds, they also hunt wild reindeer. Above is a hunter with two reindeer loaded as pack animals. Bottom is a hunter with a tracking dog. Using the berries and water squeezed from moss roots, we made the grouse into a soup. The head of the grouse was hung according to Evenki traditions in the branches of a tree. Evenki animist religious beliefs depict the souls of children who die during or shortly after childbirth as birds. Birds then are respected as spirits awaiting a second chance at human birth. Failure to hang a bird head back in the branches could result in infertility. As the soup was boiling, Oleg, the eldest Evenki hunter in our party pulled a small leather pouch from around his neck. When butchering a reindeer, small “floats” are sometimes—though rarely—found within the intestines. These are pouches of mutated skin with the fur growing internally, forming a soft leather ball. These floats are considered hunting charms to be kept and touched by none other than the hunter. He smoked the charm above the fire and fanned the smoke in all directions. Though he assured me a large buck would cross over the summit at any minute, none in fact arrived. After a freezing night’s sleep under the stars, we returned hungry and weak to camp. That night they slaughtered one of their own deer. Reindeer feed primarily off of a thick ground moss. To be sure that the moss is not overgrazed—or the local animals over-hunted—the collective migrates to a new pasture every ten days. Migrations are short, usually no farther than 20 kilometers from the old camp. An average reindeer can travel 80 kilometers over terrain too rough for a horse. Prior to a migration any wandering deer are tracked down and either corralled or bound to a tree. Camp is torn down, packed onto saddles, and loaded on the backs of the strongest deer. Then the riding saddles are placed on the personal reindeer. Children are placed in bucket-like “baby seats” made from two conjoined wooden rings that are bound to the back of the deer. The Evenki use special “baby seats” to transport their children on the backs of otherwise hard-to-ride reindeer. Riding a reindeer is no easy task. Reindeer saddles—made from elaborately decorated reindeer leather and bones—have no stirrups. Furthermore, unlike horses or mules, reindeer have weak backs and so the saddle must be placed high on the shoulders of the deer. The shifting scapulas make balancing critical, especially when crossing rocky riverbeds or in full sprint across a meadow. The deer is spurred with a long stick that can also be used in case of an emergency to recapture ones balance. A single rein is used to whip the deer or to stop it. The rider steers the animal by kicking the side of the head opposite to the desired direction. At the same time riders must watch over the remaining hundreds of deer to be sure they stay with the group. If they wander, the rider must chase after the stray and guide him back to the herd. After arriving at the new pasture, the whole family helps to pitch camp. The children gather branches for tent flooring, the men chop firewood and set up tents, and the women begin the next meal. Actually, through most of the year, children do not travel with the collective. Through most of the spring, fall, and winter the children remain back in the village with their mothers, leaving the men alone to tend the herds in the harsh weather. This is a relatively new phenomenon that has weakened traditional family ties. Prior to the forced settlements and Soviet schools of the 1930s the families all worked with the herd throughout the year. Linguistically, most Evenki children under age 20 are unable to speak the Evenki language. If their fathers still practice reindeer husbandry the children may be able to understand it. The Evenki language is only truly preserved among the herders themselves. Children typically respond in Russian. 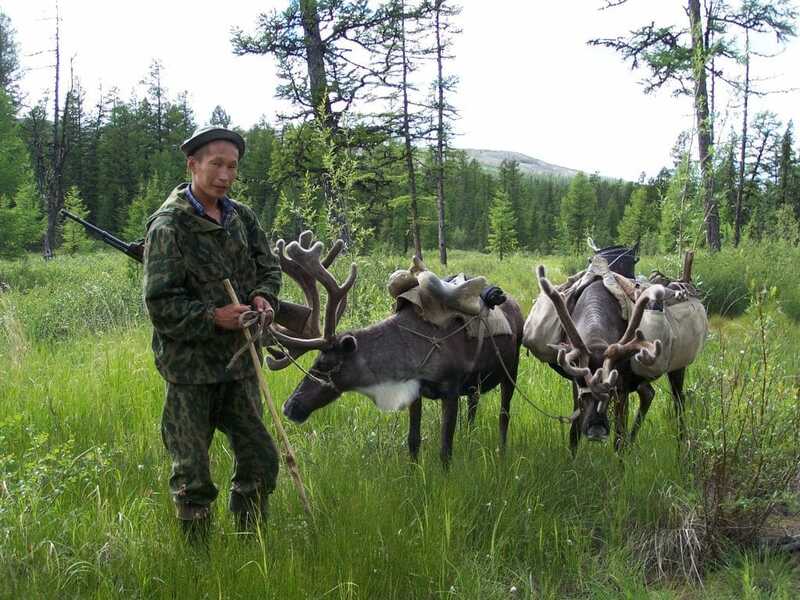 The herders, raised almost entirely in the Taiga, are also able to speak in broken, but understandable, Russian. The author of these field notes, Joshua Blackwelder, spent the 2005-2006 school year with SRAS, studying Russian at St. Petersburg State University, serving an internship at the Russian Ethnographic Museum, then transferring to Khabarovsk State Pedagogical Institute to further his interest specifically in the ethnography of the Evenki and the Sakha peoples. He used this to launch a two and a half month field research project living and working with a group of Evenki reindeer herders. He has since completed his degree in cultural anthropology at Weber State University and is now finalising his application process to a graduate program in international relations at the University of Utah. He’s shared some of his fascinating field notes and photographs below.